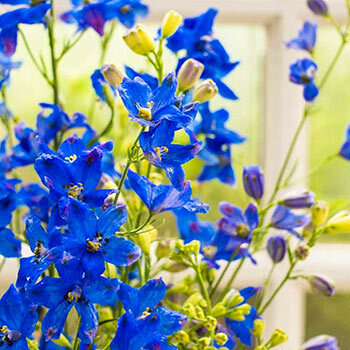 Delphiniums are cottage garden favorites for their charming flower spikes that'll draw the eye upwards. But they're normally a little high maintenance, because to keep those heavy spikes remaining vertical, you may have to stake them. That's why Diamonds Blue's small stature and loose floral spikes make such a golden combination-no staking! This very blue color is loved by gardeners because you hardly see it in garden plants. The flowers hold onto that stem for weeks and the bloom season lasts all summer long. Diamonds Blue is tough and sturdy. It's easy to grow and tends to be deer resistant. 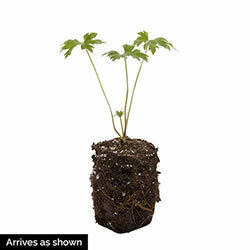 You can plant it out in your border, and it's also compact enough for a container feature. Great for long lasting cut flowers, too. Planting Instructions: Plant at soil level, addition of organic matter and Advanced Formula Plant Food will enhance first year growth and blooming.